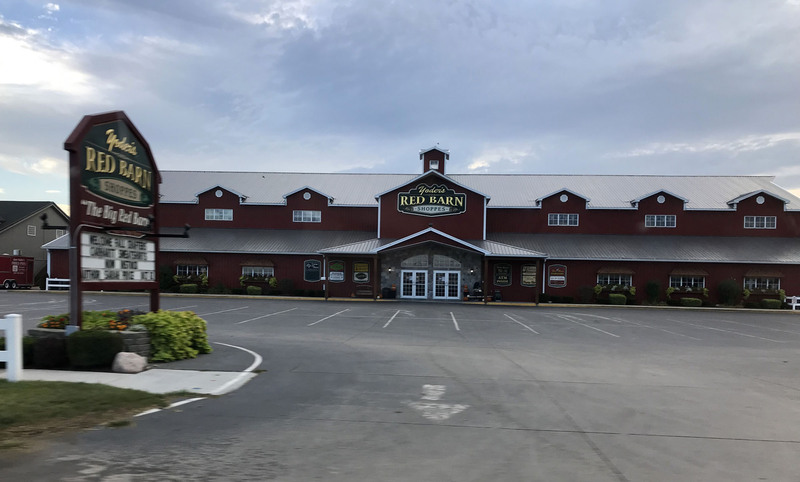 We had a whirlwind two days in Elkhart and Shipshewana, and since it was so packed with what I consider “quintessential RVer experiences”, I decided to break up the weekend into three different posts. 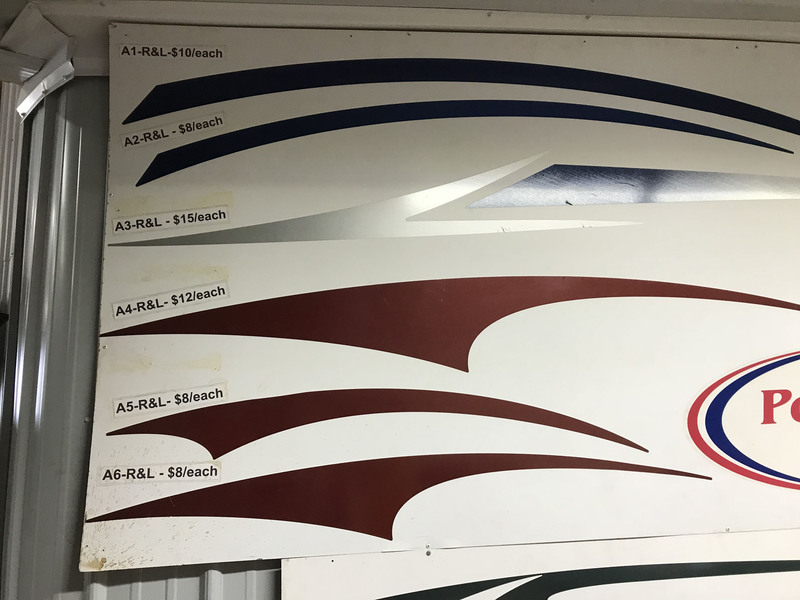 The three posts will focus on the search for custom furniture, our Mor-Ryde upgrade, and finally visiting the RVMH Hall of Fame museum. 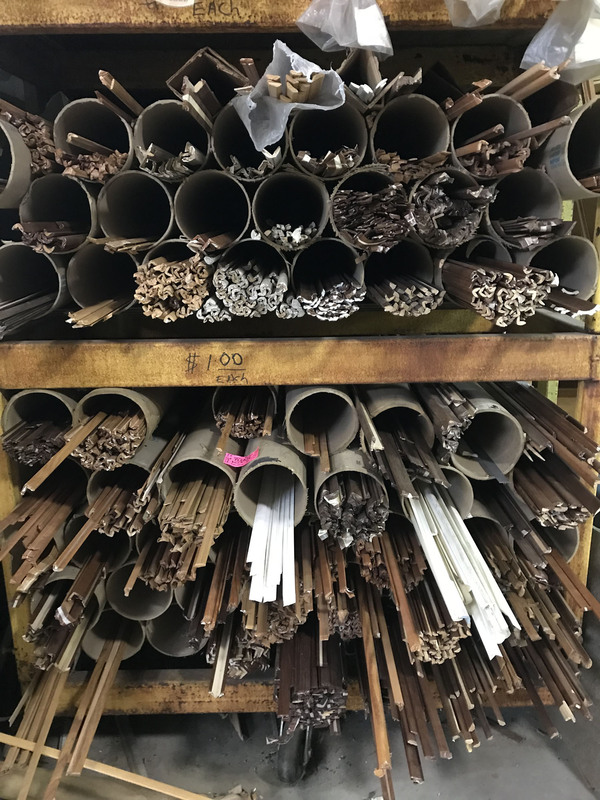 This post is all abut buying the furniture. I should take a step back and say if there is a Mecca for RVers it is the Elkhart/Shipshewana area. Many of the RV manufacturers are located in the area and it is full of shops and stores that support that industry. It’s probably not a surprise to anyone that business is booming. Almost every business had Now Hiring signs and most of the manufacturers were hiring with starting wages of $15 an hour. I know lots of folks in the country are having trouble finding manufacturing jobs, but if you know someone who is looking to learn a trade, this area of the country seems like it would be a good choice. Almost everyone seems to wander through here at some point or another and whether it’s to see where your RV was “born” or just take advantage of one of the supporting business it’s a pretty nice place to see the midwest. 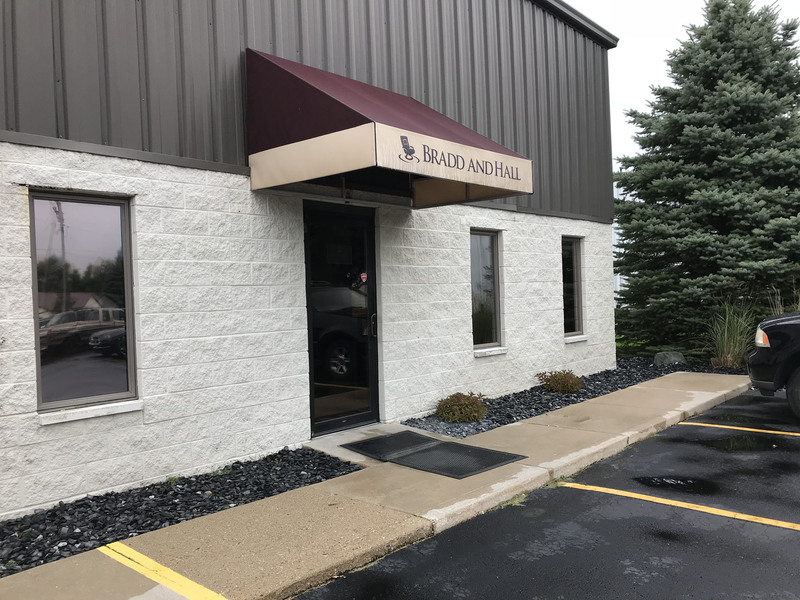 It doesn’t hurt that Shipshewana has an active Mennonite community and there are tons of arts and crafts stores, Mennonite restaurants, and furniture makers. 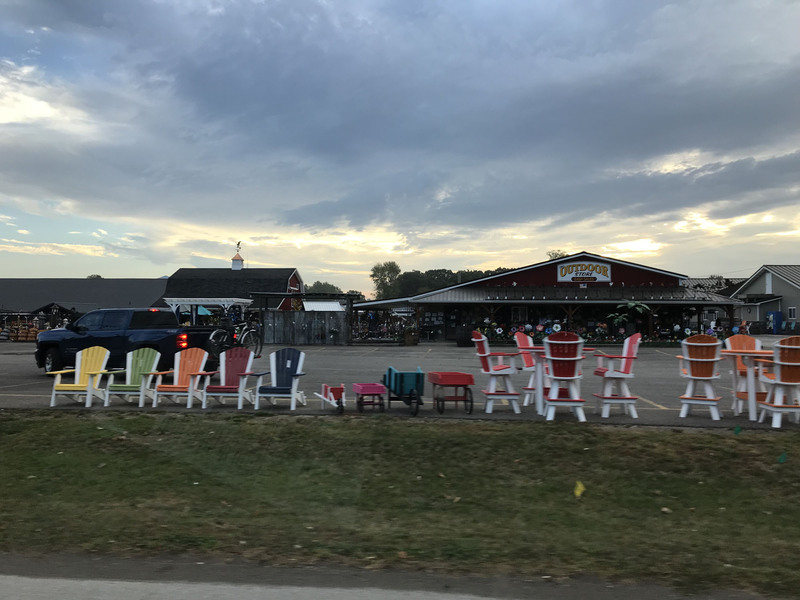 We grew up in Columbus, OH and are very familiar with Amish craftsmanship, but we were surprised to learn that some families specialized in RV furniture. Really smart considering the proximity to Elkhart and Lambright was by all accounts the best of the best. Oh and I should probably explain why we were looking in the first place. You may remember that before we hit the road, we replaced the extremely uncomfortable “couch” that came with our front living room model with a standard sticks and bricks style love seat. Because it didn’t fit in the slide (the loveseat was deeper than the slide) Lee had to build a box for the front of the loveseat base to rest on and although the loveseat is very comfortable when you sit on it reclined, your feet dangle. Basically everyone feels like they are a little kid sitting on a big people couch, which I could probably live with but the greater problem is it blocks the window behind it. I get very little air flow in that corner and over the last three years I have liked the situation less and less. 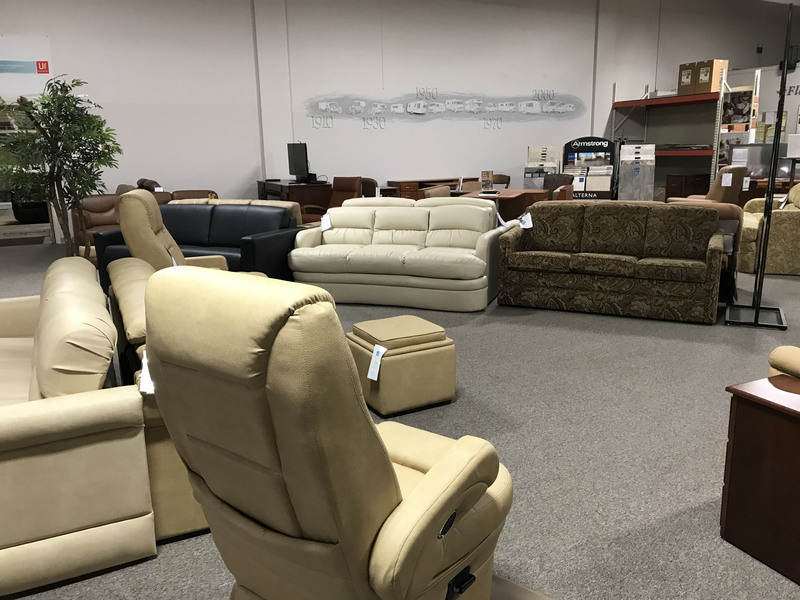 So since we were in the “mecca” of RV furniture I wanted to at least explore what my options were and although I wasn’t sure the timing or price would be right at least I would know what was available for the future. The original couch. Fit the spot, looked decent, but crazy uncomfortable. You can’t really see it from this angle, but the front “drops” down seven inches from the level of the slide box to the floor. New couch. Very comfortable, but obviously oversized. Lee had to build the box underneath because the front hung over the edge and it would tip over on occasion lol. If you’re interested you can read about the specifics on his DIY Inside Modifications page. Here’s our friends Jim and Diana the first time they came to visit. I always havepeople put the foot rests out so their feet won’t dangle and people would always laugh but as you can see it looks and feels a little “tight”. 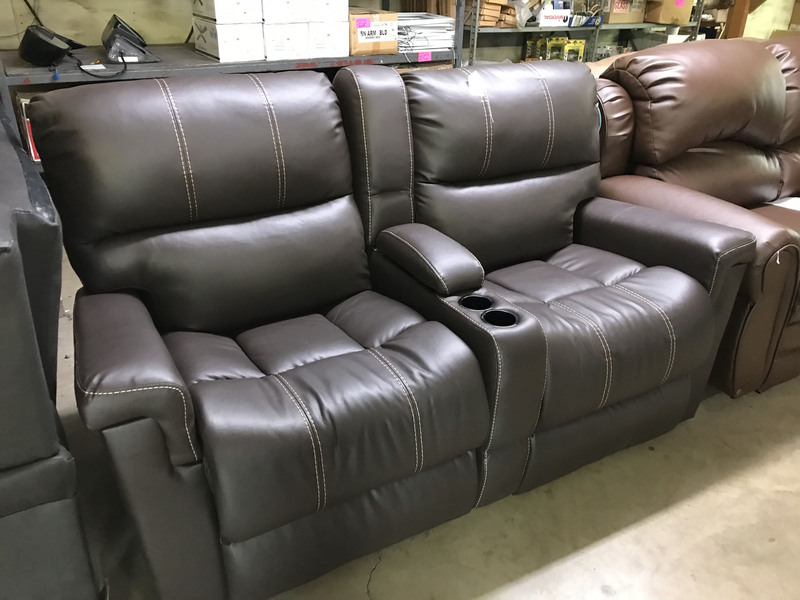 So I was looking for a couch like the original couch above, but more comfortable and with the reclining features of the second couch and decent upholstery. Tall order I knew but definitely worth a look. 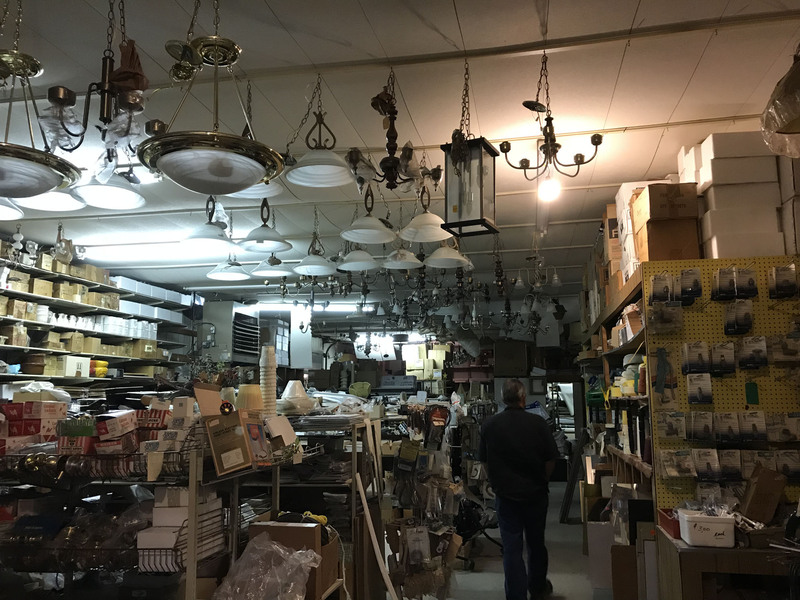 I am a bargain hunter at heart so instead of starting at Lambright’s I decided to check out the surplus stores so off we went to White Pigeon, Michigan. 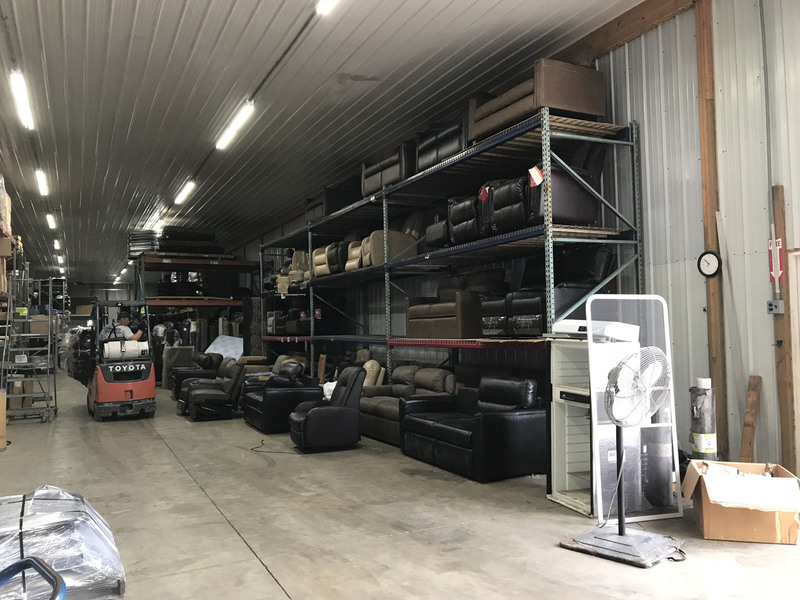 It was about 25 minutes from Elkhart and there are three surplus/salvage stores in close proximity there. 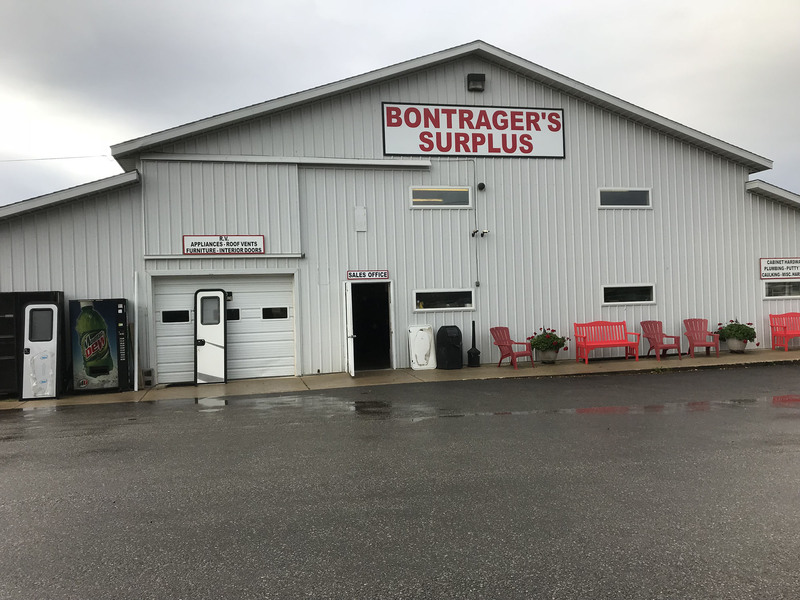 Our first stop was Bontrager’s Surplus and I was really surprised by what we found. The sheer volume of stuff available really defies verbal description so let me just show you in pictures instead. 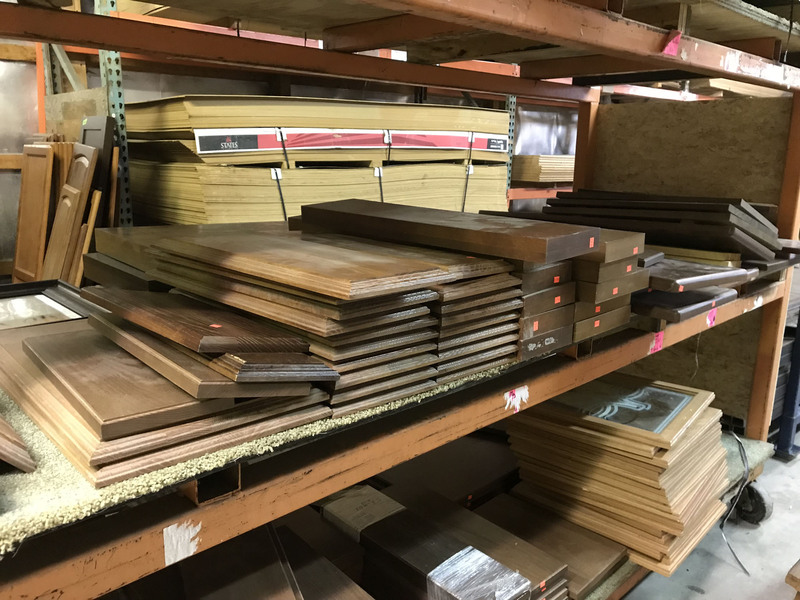 Racks of flooring, paneling etc. Check out the smile on Lee’s face. I didn’t think I would ever get him to leave. 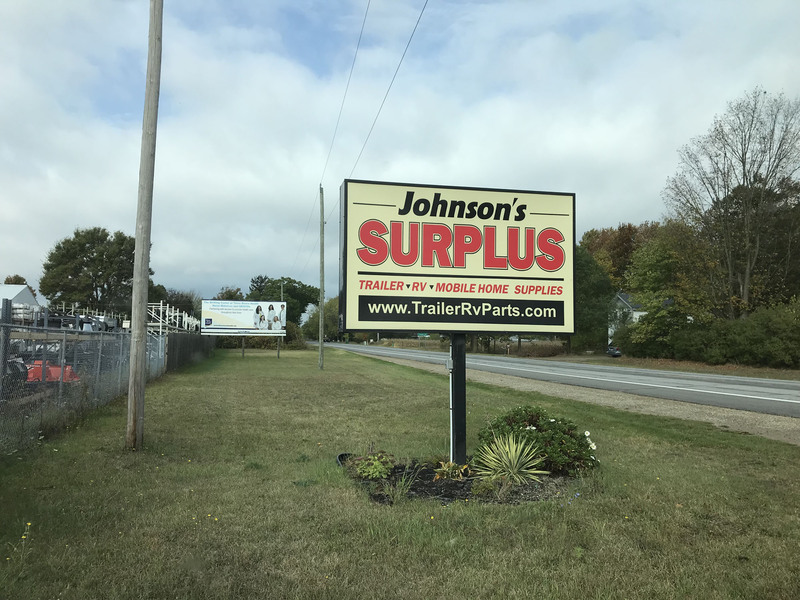 Next up was Johnson’s Surplus and although at first glance the stores seemed the same they did seem to specialize in different items and had some variety. Again, amazing amount of stuff packed in a relatively small space. This store seems to specialize in the frame more and had tons of axles and a huge stack of windows. So many axles. We saw a pickup truck come and pick one up while we were there. Finally we went to Graber Industries which was a real hodge podge of stuff. Seriously this place made the others look super organized. Even less furniture there, although Lee did find, and buy for $20, a fireplace surround. We’ve never been huge fans of our fireplace surround, and for $20 if it doesn’t work out, we aren’t out a ton of money. At this point I was feeling dejected. I’m not a snob and I felt very comforted by the fact that these places existed at all, but it was pretty clear I wasn’t going to find anything to fit that slide in one of these places. We were also vaguely on the lookout for padded kitchen chairs (ours are not and since I use that space as a computer area sometimes, and Lee sits there for several hours to make cigarettes, we hoped we could easily get a couple of RV chairs but we hardly saw any of those and they were always in sets. 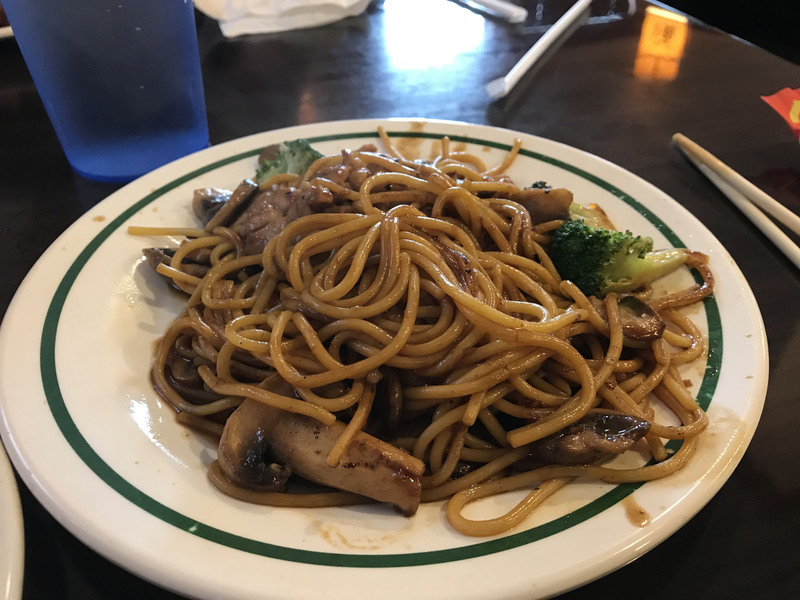 Nothing to do at that point but get some lunch, and I found a Chinese buffet in the area that was only $7.99 for lunch! After lunch we decide to head straight for Lambright’s. 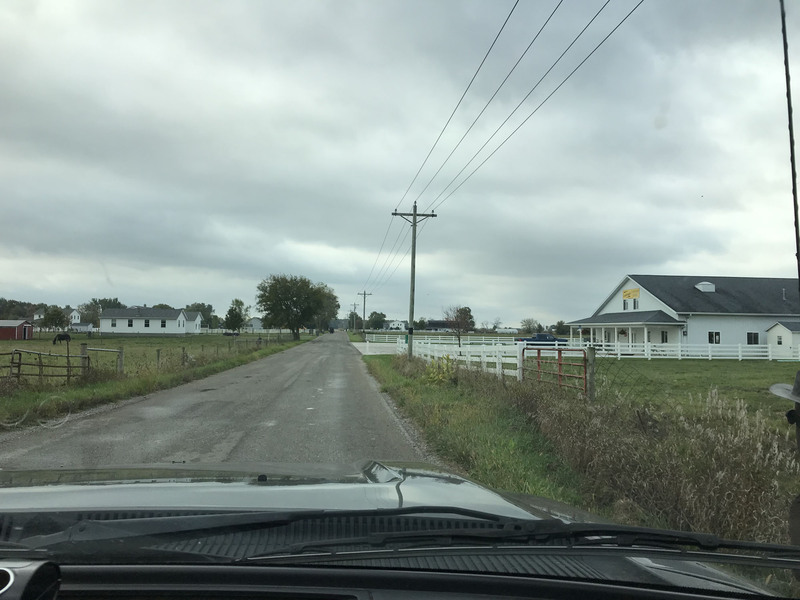 We had seen what was available in the bargain section, time to check out “top of the line.” We drove down from Michigan and back into Shipshewana and since Lambright’s is outside of town into farmland. 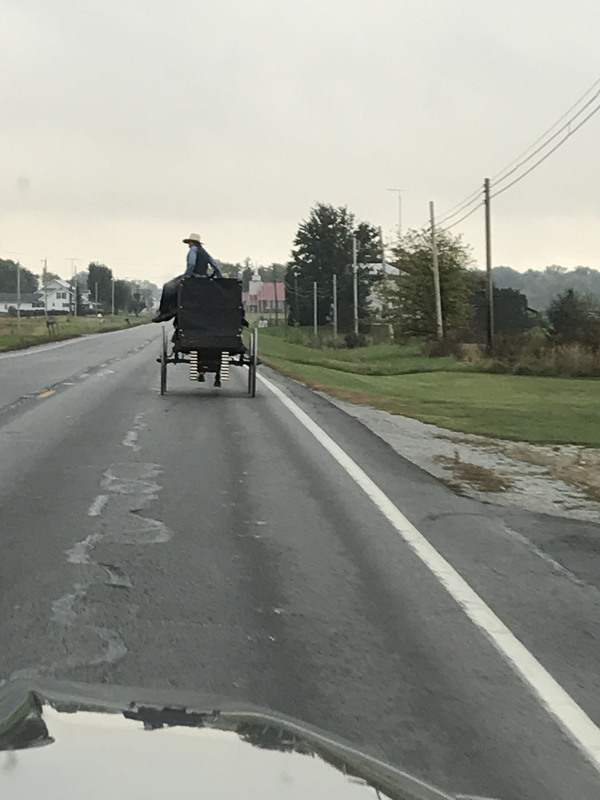 Once we got close, we slowed down because there was a ton of buggy traffic on the road. 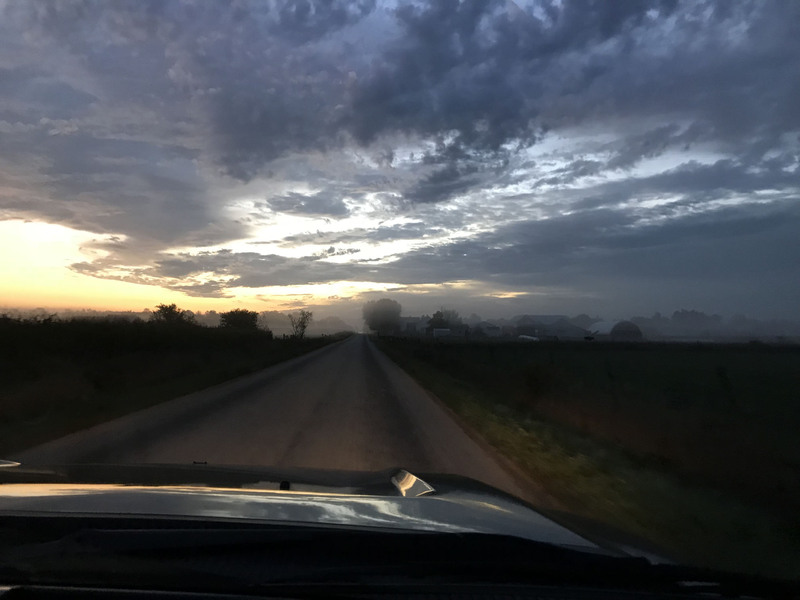 Coming from Ohio, we have some experience driving in this traffic but if you have never done it there are a few things you should know. The roads in this area are standard country roads and bicycles and buggies use the breakdown lane. Unfortunately those lanes don’t always exist or are too narrow and essentially you are sharing the road with folks going much slower than you are. 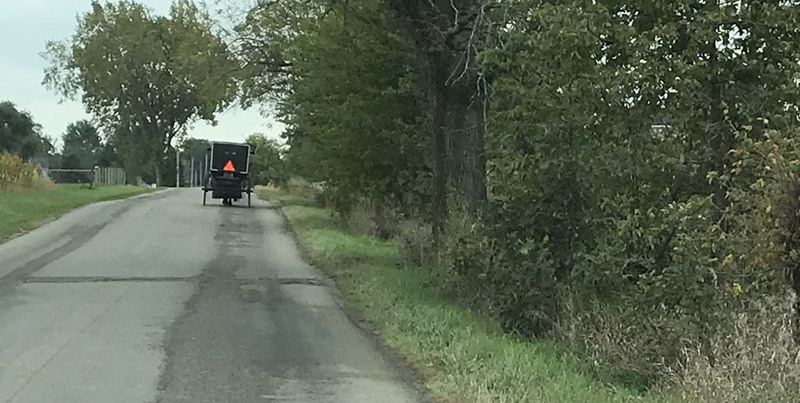 Poor driving conditions such as rain or snow always make it much worse, and all I can say is have patience, be hyper vigilant, and please be aware that every year Amish people die from collisions with cars and trucks. 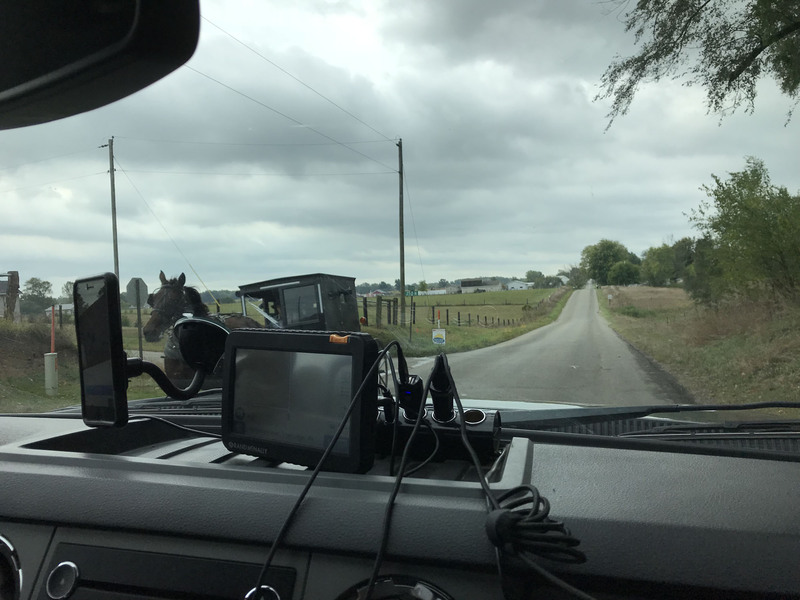 As you can see to the left, they often get very close to your car and although the horses are well trained, they are animals so one of them spooking is always a concern. I always worry more about the younger people. This was a group of teenagers and just like teenagers driving our cars they seem to be less cautious. The kid sitting on top made for a cute picture but as a mom made me cringe. 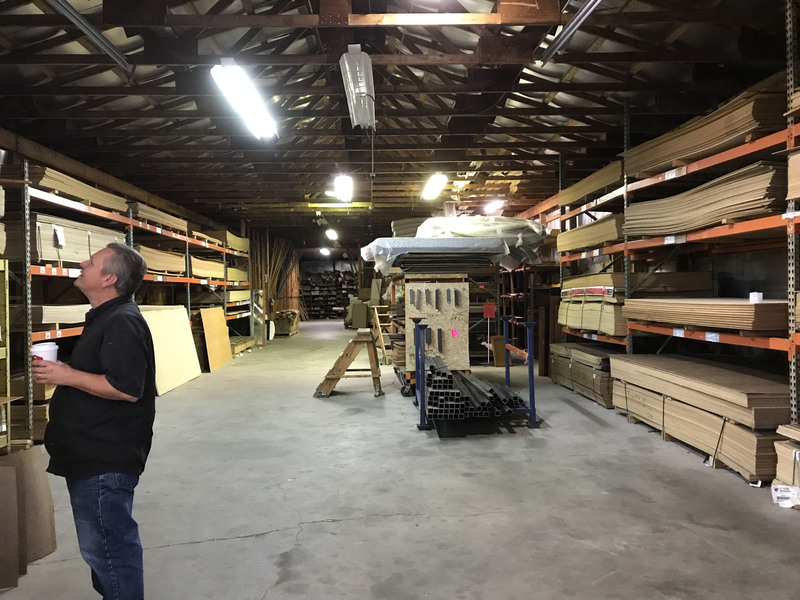 We finally arrived at Lambright’s which is a large facility but was only manned by the owner, Vernon, and one of his sons. 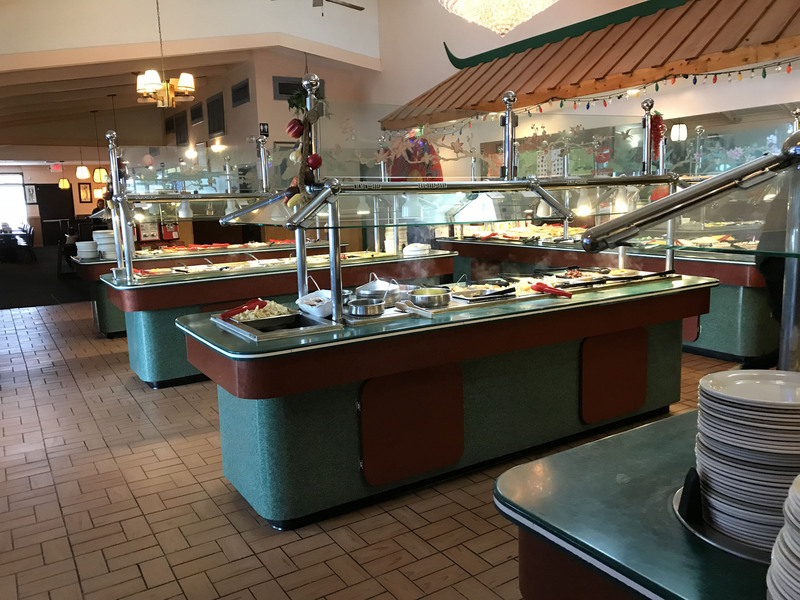 It is a low key place, but with a wonderful selection and the furniture was incredibly comfortable. We started to explain what we were looking for and Mr. Lambright was familiar with the problem. He flat out said that a comfortable custom couch could not be made to fit the slide and went on to explain that the problem was the height of the back, He further said that if anyone said they could make a comfortable one they weren’t telling the truth but that he had taken his couches in the past and built a rolling platform for folks to put their feet on for other people. That was interesting and very similar to what Lee had done, and it was good to hear from a credible industry expert that it was a tricky problem. As Lee and he were getting into specifics I wandered around and randomly sat down in one theater seat setup. Wow, was that couch comfortable and as I sunk into it, I understood immediately what all the fuss was about. Mr. Lambright just smiled when I asked about the model and stated “The Lux” model was brand new and he didn’t even had information sheets on it yet. 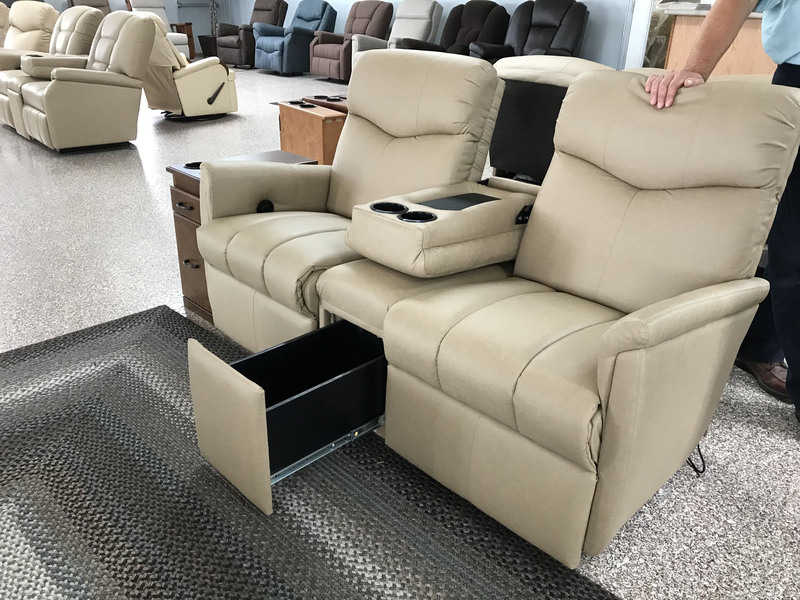 The price in ultra leather (which is the material most RVers want) with mechanical levers (versus electric) was $2055 though and I sadly stood up since that was well beyond what I was willing to spend. We thanked him for the information and left, feeling a little dejected by the overall lack of “middle-range” choices. 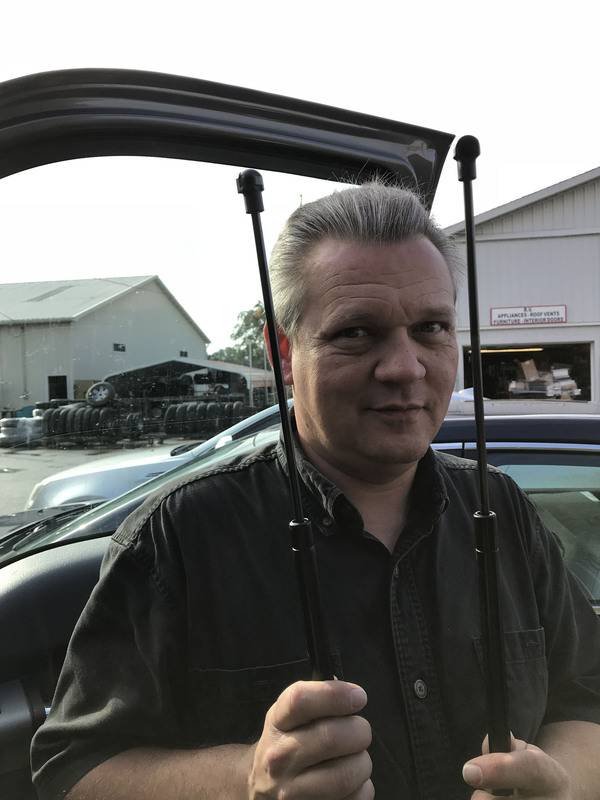 On the way back to Elkhart we stopped at Mastercraft but there was a handwritten sign that they were closed for a couple of days and then at Brad and Hall which carried multiple vendors in one location. The best part of Brad and Hall was the wonderful salesperson Suzanne who talked to me about different fabrics. I always knew I wanted cloth instead of leather and was surprised to find out from her that there was a significant difference in price. She didn’t carry the Lux model yet because it was so new but said that a similar brand was actually $650 cheaper if you purchased it in cloth. Well, that was interesting, and something we didn’t discuss with Mr. Lambright, probably because almost everyone goes with the ultra leather. She couldn’t give me a price on the Lux but was happy to get a quote but said it would probably take until the next day because Lambright’s generally only answered their phone once a day. I really liked her so asked her to get a quote, and Lee and I headed back to Elkhart. It had been a long day, and we weren’t done yet as we were going to see our friends Pat and Bridget. It had been over a year since we stayed with them in Louisiana. 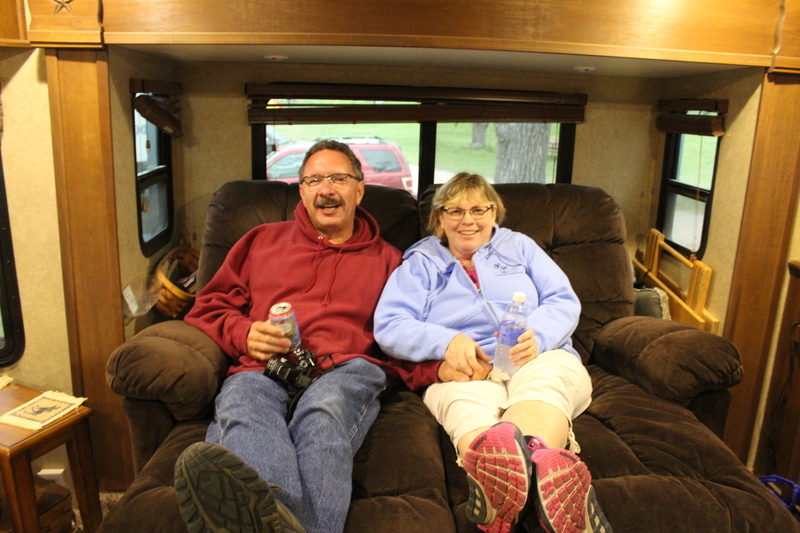 We were delighted to discover they were in Shipshewana getting some work done on their new fifth wheel and met up for dinner at the Chubby Trout. We stopped first to see their pretty new rig and I really enjoyed the tour. Once again we picked up right where we left off with an RVer relationship and the time just flew by. We left them with hugs and promises to get together next year and went back to our rig for a good nights sleep. I was really tired at this point and pretty quickly was fast asleep. The next morning we were once again up and moving very early and I decided I wanted to go back to Lambright’s. I was very curious what his price would be in the cloth and more importantly wanted to discuss how that would impact the comfort. We arrived at 7:30am and waited until they opened, and it was a beautiful, foggy morning. Once inside I tentatively asked about the cloth, but he did confirm that it made the couch “stiffer.” Unfortunately he didn’t have a version in cloth but there was a similar chair I could try. Although I didn’t sink in, it still felt pretty great and the lumbar support is amazing. Truly I think that is their secret. He did confirm that the price was $650 cheaper and we talked a bit about how we would take delivery. At this point it was still informational and we were bummed to find out that there was a 5 week lead time and they were closed for the two weeks after Christmas. Our thought was we could swing by after Amazon and pick it up but the two week closure made this impossible. He was extremely helpful talking through options and at one point stated he could make himself available for us to just come and pick up the couch. 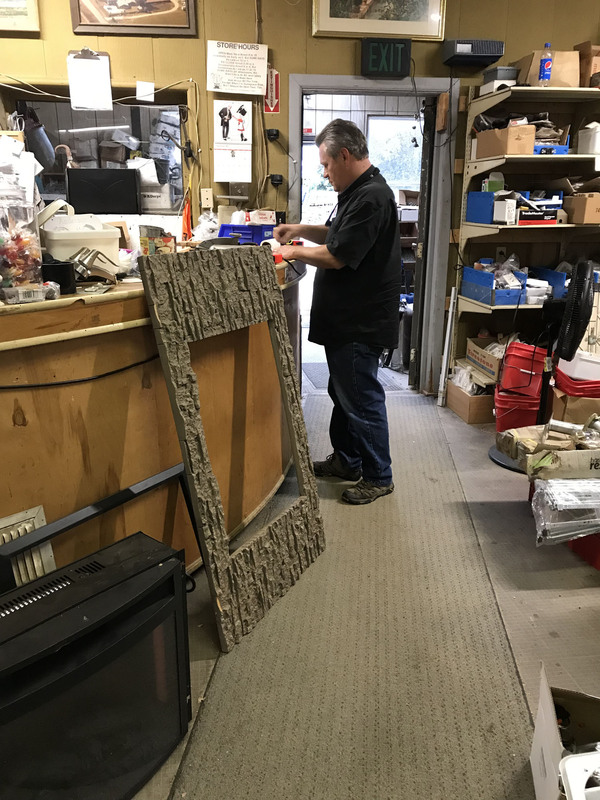 Our other issue is how we would dispose of the old couch, but he did say we could leave it for a small additional charge and he would donate it. I liked that idea since it is a perfectly good couch, but Lee wasn’t crazy about the idea of switching couches in a parking lot in late December. Understandable! Armed with new information we once again thanked him and then left to discuss our options. Money aside, both of us were concerned about navigating these roads in late December and since he doesn’t carry a cell phone I was extra concerned about how to communicate with him if something went wrong. Since Suzanne at Brad and Hall had mentioned something about shipping I called her back and she did verify they could ship the couch to Kentucky where we would be working. The shipping cost was a very reasonable $195, but this was further offset by the fact we would save $110 in taxes by shipping out of state. Now that was interesting, and something we thought we could work with. She also had the final quote from Lambright’s and although their price was $300 higher than his, they accepted American Express (versus him only accepting cash or check) and they of course had email and phones, which was a big deal to me since this whole thing was somewhat complicated. OK so now the price was only $1855 total, and that included everything I wanted, along with shipping. Since we have been running so tight on budget and our Mor-Ryde was more than expected (teaser for next post) it really wasn’t a great idea. 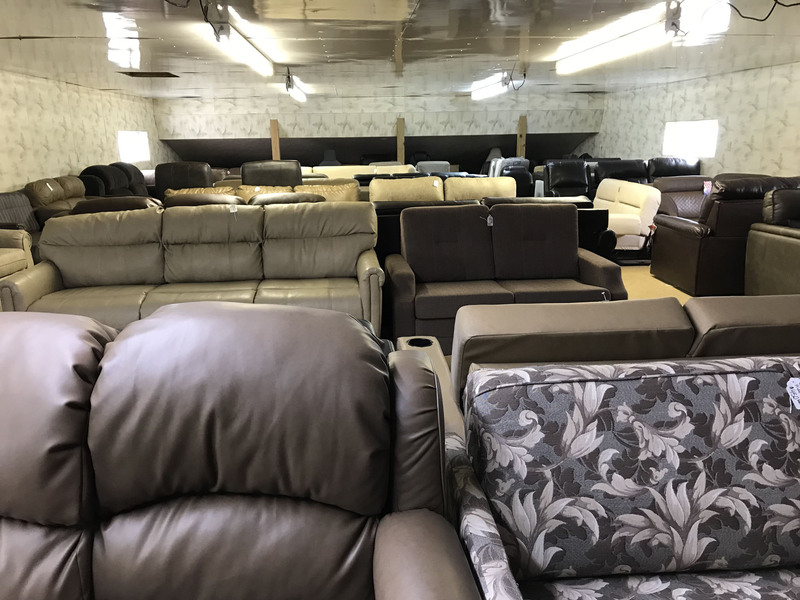 On the other hand I had no idea when I would be back in this area and the price was more than fair for what I would be receiving, and I had no doubt that the Lambright furniture was of the highest available quality and would hold up over time. Ultimately I made the decision to go ahead and buy it, and hopefully I won’t regret that decision when I receive the couch. Even if you aren’t looking for RV furnishings, I do recommend that you do some looking while you are in the area. It will be good to know what is out there and there is nothing like sitting on an actual couch which is something you can do when you are here. Plus it allows you to see the Elkhart/Shipshewana area, which I really enjoyed. Or you can check out our recipe book filled with 80 real recipes we have cooked in our RV and taste tested by Lee himself. The cookbook specializes in recipes that have a limited number of ingredients, without sacrificing flavor and is organized into categories that matter to full time RVers such as Instant Pot recipes, Travel Days recipes, and Pot Lucks recipes. You can preview the kindle version on Amazon or the Apple version on Itunes. It is also available in paperback . 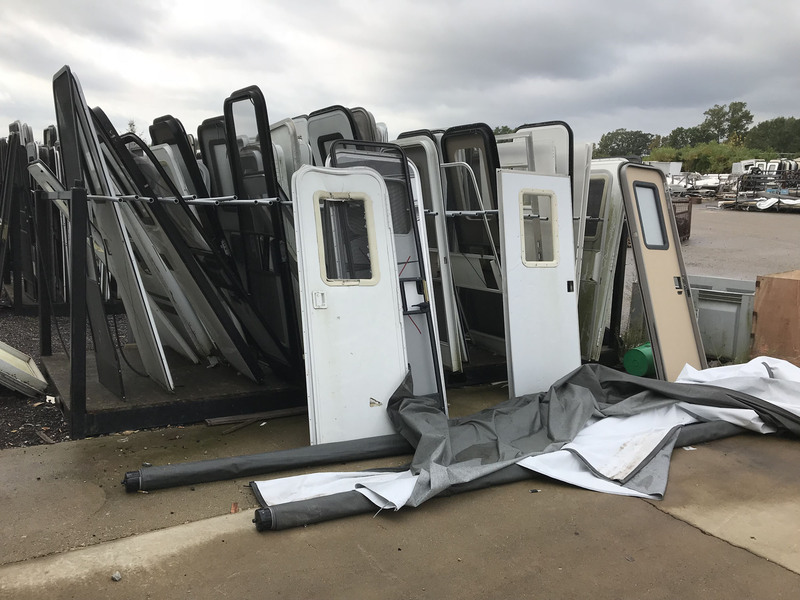 This entry was posted in Lakeside and tagged Bontrager's Surplus, Johnson's RV surplus, Lambright Furniture, Open Range plant, Shipshewana. Bookmark the permalink. 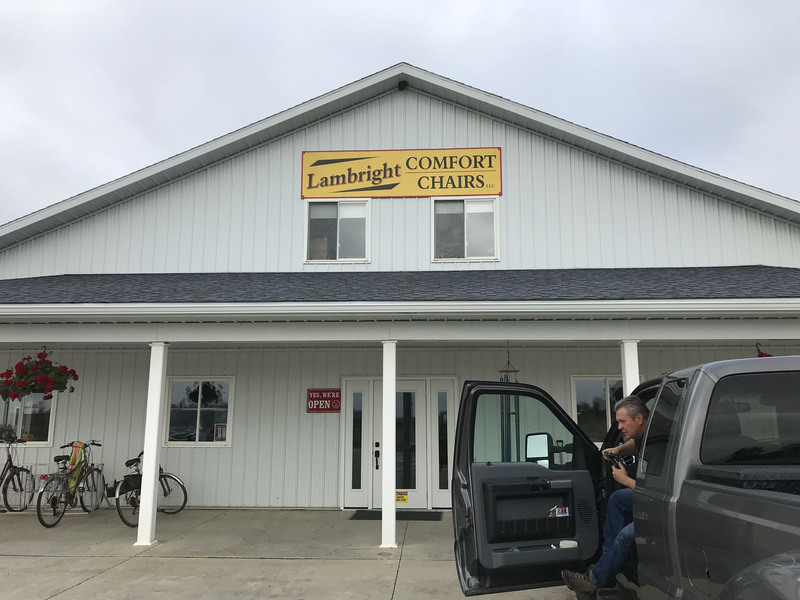 We purchased our chairs from Lambright a couple years ago. You won’t be sorry. They have great construction. 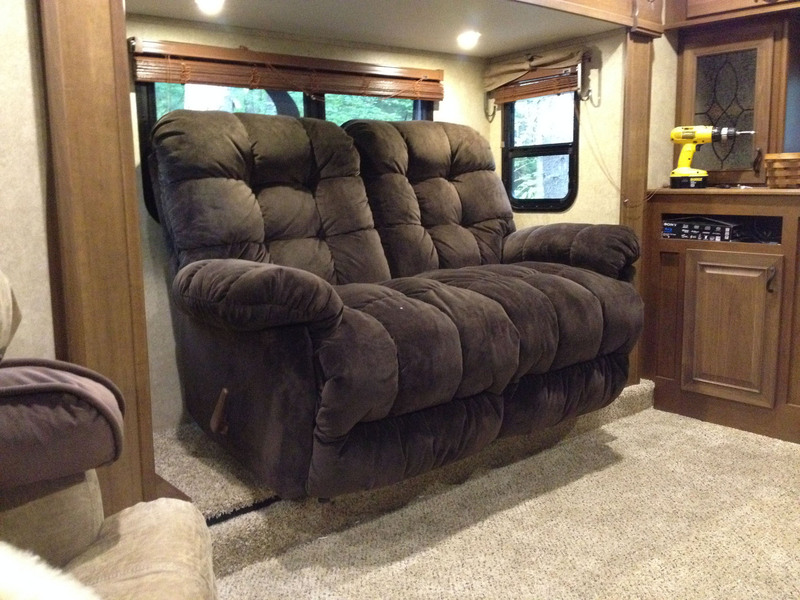 I’m still new to RVing, but would it be possible to take an rv couch to a regular upholsterer? Keep the frame but upgrade the cushioning and fabric? I admit I have no idea what that would cost vs. buying a new couch. The problem with regular couches is their size and weight. This was a loveseat and still the back is too high. That would probably work though and in certain model RV’s that’s definitely an option. With ours being in the slide though much more complicated. Gonna miss Edith Ann! Flipping that center console down should help that airflow issue, Tracy. Good to know that cloth option exists…it will soften up and the price is palatable. Lee, several months back I sent you a note, asking you for your opinion of a unit I was looking at through Augusta RV. Finally taking the plunge to go full time. You told me you didn’t know much about the unit we were looking at, but strongly suggested we attend a Dreams-RV how-to seminar. Well, we went to TN two weeks ago and sat through a week of important, interesting, and probably very pertaining information. We are both glad we make the trip and took the time. We learned a lot. Should have our rig by mid November. I told Howard what a fine ambassador you were for Dreams-RV. He gave me a big smile and told me they valued your friendship. Thanks for the advise, and although I have been following Howard and Linda for 7 or 8 years, meeting them was quite enlightening. What a couple. Well worth the effort. That’s wonderful Jim and I am so glad you took the advice and found the seminar helpful. A friend of Lee’s who he worked with many years agi, Jane, was also there and found it valuable as well. Thanks for the shout out to Howard! We are friends but I am also a huge fan of who he is and what he does. He still inspires me. So sweet that you took the time to write this and I hope we meet in person on the road some day. This is Penn and Debi Marshall. We have been in Southbend KOA since last Wed for a wedding. We will leave on Sunday. Really enjoyed this place and your email! Going to Shipshewana on Thursday. Where did you guys stay? Are you still in this area? I am sorry too miss you. We were only their two days and stayed in the Mor-Ryde facility. Checke out Eby’s Campground. We never stayed their but some friends of ours loved it. Can’t wait to see the new couch and chairs! Our couch is still ok, but our recliners are starting to look BAD! I’ve never liked that they are also swiveling. Not sure when replacing them will make it to the top of the budget but we will definitely check Lambright when it’s time! What a fun day you had! 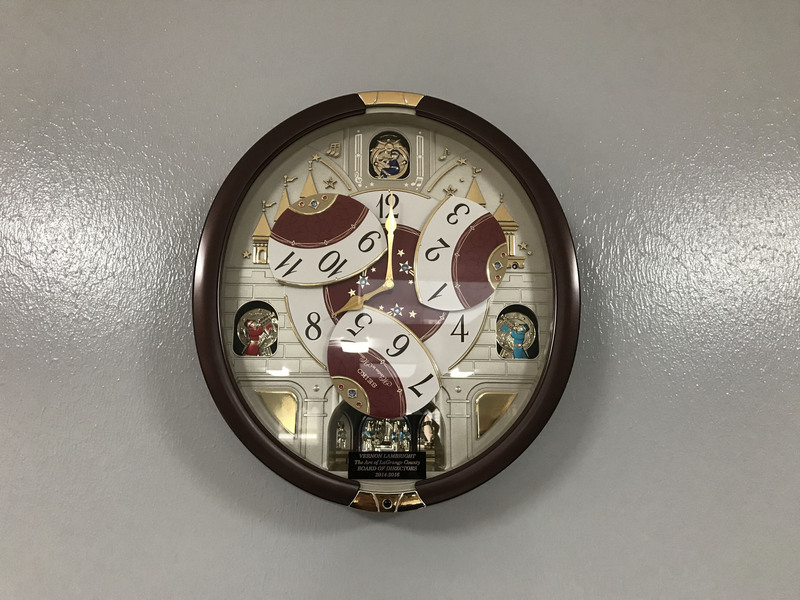 That clock is really neat!